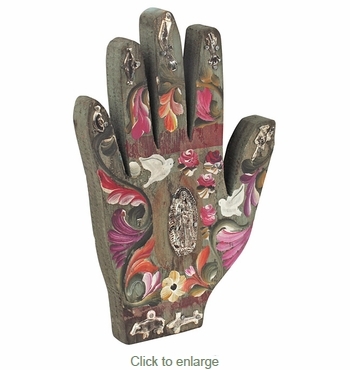 This Mexican folk art wooden hand with tin milagros is representative of the classic religious art of Mexico. After cutting, each is hand painted utilizing time-honored folk art patterns and adorned with traditional milagro charms, giving each piece its own character. Hang these unique wall plaques separately or create a grouping to add color and a touch of Mexican charm to any room. A hang hole is provided on the back. Unique Assortment: Design, colors and Milagros may vary on these one-of-a-kind hand crafted hands. The ones you receive may not be exactly as shown.